Description: Wish there could have been a few more slides showing the rerailing of this unit. Must have been fascinating to watch. Slide was taken by R.W. Ferge. Description: Yard switcher SOO (x-MILW) 1514 shoves a cut of cars as 4426 sits on the ready track. Description: Low quality image from July 2002. Northfield, MN, behind Kwik Trip. Description: Low quality image from sometime in/around July 2002. Behind Kwik Trip in Northfield, MN. Description: ON THE WASH HEADING FOR LOUIE ALLIS MIL.WI. Description: SWITCHING ON THE GRADE MIL. WI. Description: Gets a lil' hazy at the back(damn sun! ), but an 8 engine consist nonetheless. Title: IS IT MONDAY YET? Description: CP's Transfer 1 backs across Arlington Ave with five boxcars, leaving the rest of its train down below. Description: CP's Transfer 1 uses Soo Line Junction to access its almost daily route. Title: SOO 4426-4401 Tomah Sub. Description: CP Train 580s Power Returning to the West end of the Yard. Description: CP train #581 backs toward the CP yard to gather up his train. Description: A nice looking pair of Soo GP38-2s do some work at Shoreham as the day comes to an end. Description: No stranger to Camden, SOO 4426 joins sister 4423 today as they go about some switching. Description: Two red and white Soo units power todays Grove Job as it heads back to Humboldt Yard. Description: The CP Grove Job heads past the BN Grove Job tracks as it makes its way back to Humboldt. 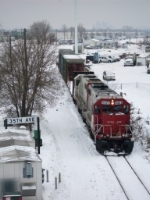 Description: A pair of Red and White 38-2's pause for a moment as they switch a few cars at Humboldt. Description: The Scrap Job makes its way down the line before doing some work. Its nice to still see pairs of Soo units together in 2010. Description: It was standard practice on the Southern Ry. and Norfolk & Western to operate hood units long-end forward by default. Not so much here.